Chennai received its heaviest rain in a century resulted in a flood like situation. The death toll has reached around 200 in the rain affected parts of Tamil Nadu and the condition is still critical. Army and Navy have arrived for the rescue operations in Chennai and other parts of Tamil Nadu. The excess rain coupled with improper drainage system resulted in disastrous circumstances in the city of Chennai. 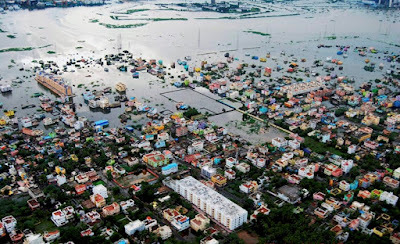 Chennai always receives more than normal rainfall in every twelve years, although situation became out of control due to heavy rains the authorities were not prepared for even the excess rains. According to environmental surveys of Chennai city, natural drainage system has been destroyed for the development purposes. Ponds, marshes, streams and other natural waterways have been damaged and replaced with illegal constructions. Chennai is not the exception; every metropolitan city is prone to such urban floods which caused due to excess rains as these cities have altered their natural drainage and sewage system for the sake of development which is unplanned and not researched for effects on environment. The changing climate has affected the seasonal pattern of the world over and many world cities receive untimely rain, excessive rain or no seasonal rain. The climate conference going on in Paris i.e. COP21 (Conference of Parties) is useless if they can't find the way of development without hurting and destroying the environment. We have only one world which has limited resources which need to be conserved and cared. Coming back to the current problem of Chennai, I can only hope and pray for conditions to normalize soon and hope for discussions on strategy to deal with such problems in future and to find out ways to prevent them. One think I also like to mention is that every human being in Chennai is helping other irrespective of caste and religion.The country is concerned for Chennai even though the mainstream media has not given it much space. I appeal same concern for climate related issues. Governments act when there is a public outcry, crops are being damaged, islands country feeling threat of submerging, people leaving in coastal regions are migrating to the main land due to rise in sea level, climates have altered patterns and air quality have worsen, this is the right time to raise your voices and jolt your governments to act for the environment. Pray for Chennai. Pray for world. Hope Chennai get back on its feet soon and normalcy is restored. Hope government does something for dealing with such incidents in future...but considering the history of our piliticians, it looks very unlikely! May God have mercy on Chennai! Chennai is gearing up and coming back to normal, thanks to the himalayan support by common people who volunteer around the city for its retrieval. Chennaities are fighters. Nice one. Visit @ Tamil News to get latest news!!! Came across an article and thought of commenting on a old blog! Chennai came across the highest rainfall in the century. We all heard the negative news about media but of course there are some positive things happened as well! Entrepreneurs from chennai came up a initiative to help the needy ad this how the help was provided to the needy people. Entrepreneur like Varun Manian, Founder & MD Radiance Realty has come up Radiance Ginies to help the poor and needy!